A group of Saudi investors in Bahrain will launch a petition in November urging the kingdom’s leaders to help revive a stalled multi-million dollar beachfront residential on Janabiya Highway. The petition will be the third of its kind to be set up for the $750m Marina West project which was scheduled for completion in 2009. It was delayed and put on hold in 2010 due the global financial crisis, according to the developer, reported Gulf Daily News. A total of 400 people invested in the project which was due to feature 11 residential towers including a five-star hotel. “It’s high time we did something about the issue which has been going on for years. The idea is to work together with fellow homeowners from Bahrain to collect signatures on a new petition expected to be launched next month that will be presented to top officials in Bahrain,” said Saudi national Shadia Alauddin who is heading the campaign alongside her brothers Dr Ali Alauddin and Omar Alauddin. The siblings had each paid 2m Saudi riyals for three-bedroom apartments which they upgraded to duplex units in December 2008. “[The developer] offered us really good discounts and we all decided to upgrade as we were promised the units will be handed to us in March 2009. There are many investors like us in Bahrain who paid hundreds of thousands of dinars in the off-plan development at the time and are still waiting for work to resume,” said Alauddin. She said investors would like to work closely with Marina West Home Owners Committee in Bahrain to possibilities of completing the project or options of refund and compensations for those who do not wish to be involved any longer. “We do not want a developer to take up the project and do a lousy work. I will be visiting Bahrain to hold talks with homeowners over the petition. If there are potential investors who are willing to complete the project we would like to know about them and even hold talks in Bahrain to present our case,” she said. 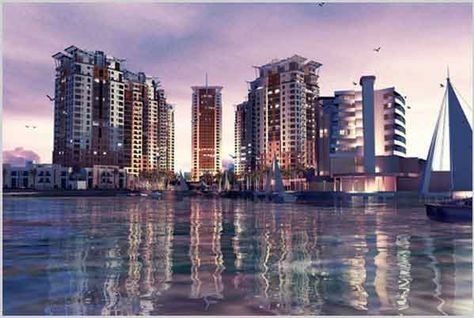 It is believed that over $1 billion (BD400m) is needed to complete the four main stalled projects in the Marina West project. Experts have suggested a public auctioning of the projects as well as a bailout fund in collaboration with the private sector. Funds for the project could then be collected after shares for the proposed company were issued to the public. The four main projects have already been referred to the stalled property committee for the settlement of real estate projects for review. In order to prevent real estate projects from getting stalled or cancelled, the Central Bank of Bahrain in June announced new regulations which would force developers to deposit money in escrow accounts of licensed retail banks in the country. Work on three stalled projects in Bahrain has resumed since the committee’s intervention. These include residential projects Villamar, Riffa Views and Landmark Cityview.